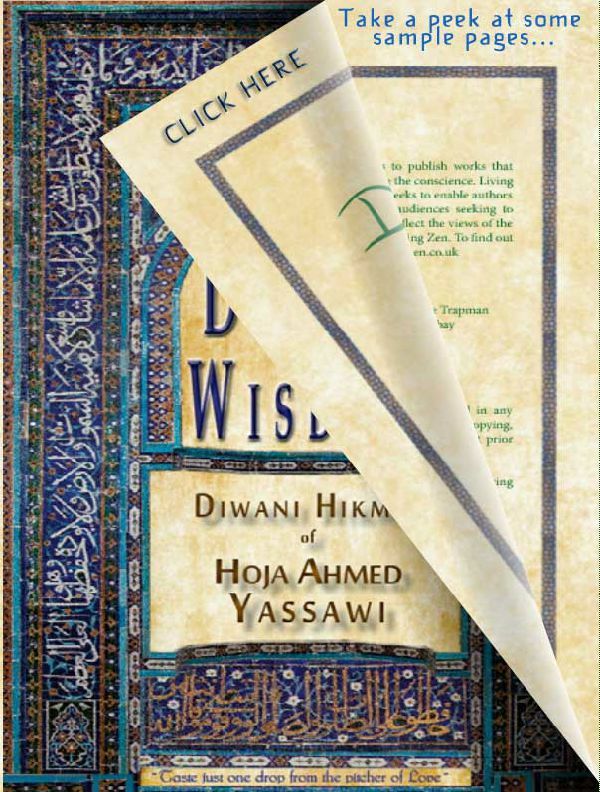 Diwani Hikmet (Divine Wisdom) is the volume of verses and prose Hoja Ahmed Yassawi, left for future generations. Mostly composed underground in the cell he confined himself to from his sixty third year to his natural passing some sixty three years later, in Yasi (now Turkestan, these Hikmet give us a glimpse not only of his whole life and times, but more importantly the times that were to come. As can be imagined, confined to a cell hardly higher than his own height and long enough to lay down along, with a width enough to support a low writing table and collection of wax candles, his output was enormous. He tells us he composed over ninety nine thousand Hikmet during his period of seclusion. A prodigious quantity, yet today we possess a mere handful, a few hundred verses having been discovered so far. Diwani Hikmet is a collection of one hundred and forty nine of these Hikmet and includes Munajat, one of the few prayers Yassawi wrote in adoration of the Divine.Yassawi wrote his Hikmet in the now extinct Turkic language of Chagatai ( a sample of this can be seen left ). 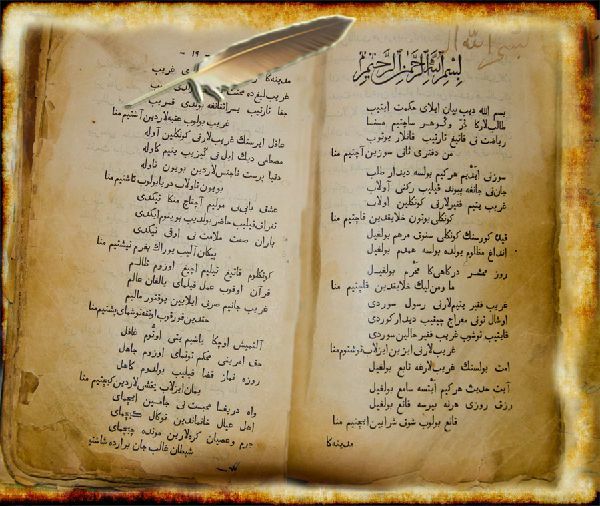 "The heart speaks and the hand writes "
He was keen to write in the tongue of his people, although for many Sufis and poets of the time Arabic was the prescribed form. So often a rebel, this was not Yassawi's way. We are eternally grateful to him for having supported what was then a huge Central Asian collective. His verse is written in quatrains and couplets. Although these forms are commonly rhyming, he throws all to the wind and uses sometimes rhyme and most times unrhymed couplets and quatrains. He uses a powerful repetition in his verse, which has the effect of deepening the reader's experience. One striking and very powerful experience we had in translating this original work into English was the extraordinary prescience it conveys of our present world, in all its conflicts, chicanery, spiritual paucity and worldly excess and pursuits to the detriment of the true purpose within the gift of life we are given. Nine hundred years separate us from his original penned work yet you would be forgiven for feeling it was only recently written due to the similarity within two epochs. The transparent and honest portrait Yassawi paints of himself, his struggles to tame the ego, release from the worldly, his devotion to his Creator and Love and his relation with death and the afterlife are timely and uplifting. "Whatever I say in exposition and explanation of Love, when I come to love (itself) I am ashamed of that." With Ahmed Yassawi we have someone vested in the love of the Lord since birth.